Ioannis Bourousis plays a sensational game, he attacks his career-high, six year old, when he still played for AEk Athens and scored 26 against Benetton Treviso. EA7 starts beuatifully its big Euroleague adventure, protects the home-court, pleases its fans which made big noise especially in the second half. 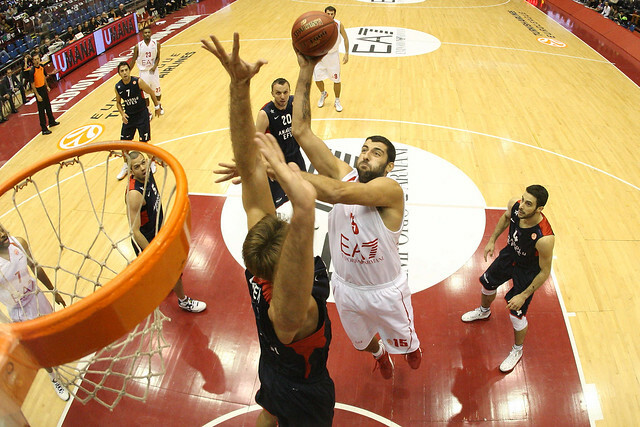 Bourousis scores 23 points and grabs the big rebound that stops Efes’ comeback in the closing minutes. He draws a foul, make a free throw and the game is won. A great game for him. Bourousis scores the first 8 Olimpia’s points thanks to two threes and two free throws. Efes is starting better. With a 6-0 run, helped by an unsportmanlike foul called on Hairston, goes up by six. EA7 responds: Keith Langford is offensively aggressive, he ignites an 8-0 run and suddnely Olimpia is up 16.12 before closing the first period 18-15. Efes is zoning in the second. But Olimpia is getting away after a corner three by Alessandro Gentile. It’s 23-16. Jordan Farmar responds, Gentile scores two free throws for five consecutive points. The biggest margin is set at eight after Nicolò Melli closes a fastbreak. That’s when Efes is producing a big reaction, scores nine consecutive points and goes up again after a Savanovic three. Langford scores a three, Bourousis scores, Fotsis male a transition three and Olimpia is again up 35-32. Fotsis scores again, Bourousis from the line reaches 12 at the intermission. Olimpia is up 40-34. THE SECOND HALF – Sasha Vujacic is aggressive but Bourousis and Langford, 19 points at the half, keep going strong. Hairston makes a huge three and now the margin is in double-figure, 55-45, in the middle of the third. Then it’s 16 when Langford and Melli make back-to-back threes. Jamon Lucas makes two big baskets driving through the lane. Coach Scariolo calls a time-out. Rok Stipcevic makes a terrific three and at the end of the third is 64-50 Olimpia. A Batuk three reduces the margin to non, Savanovic scores and from a seemingly solid plus 18, Efes is within seven with 5’29” to play. Basile makes his only basket but it’s a huge three, another three is coming from Hairston and then it’s the Cap, Omar Cook. With 3 minutes to play, Olimpia is up 77-65, But Efes keeps coming back: Jordan Farmar draws a foul on a three by Langford, makes all his free throws, then scores again on a fastbreak. With 48 seconds left Efes is within 4 points. Bourousis grabs the a big rebound that closes the game.